I have been in a quandary as to what to post for this award. I have taken far too long to celebrate the honor. For that, I apologize. Just as I figured out what to make, we went out-of-town to visit friends for a weekend get away. Lucky them, they got to eat the vast amount of Chocolate Pate I made for this post. Barbara at My Italian Smorgasbord has a lovely blog full of warm delightful recipes. I encourage all of you to go read her blog and make one of her recipes. You will be back for more! The “rules” of the game is to share a sweet recipe, tell 7 things where sweet has influenced your life and then pass it along to 3 other fellow bloggers. I thought long and hard about what to make for this award. Barbara’s Swedish buns were amazing. What could I make that would be deserving of this award? Not being much of a cake baker, I looked at other desserts I was known for at my restaurant. It was a toss-up between Chilled Key Lime Souffle and Chocolate Pate with Raspberry Coulis. Chocolate won. I’ll make the souffle another time. Do not get any water into the chocolate. Even one drop will seize it up and makes it very hard to get a smooth melt. Make sure your bowl is dry! To make a double boiler, simply place a heat proof bowl (Stainless steel bowl is best) over a pot with boiling water. Make sure the bottom of the bowl does not touch the top of the water. Check and make sure the flame from a gas stove is not reaching around the bottom of the pot and touching the sides of the bowl. This will burn the chocolate. Use a towel or pot holder to hold the edge of the bowl. It will get hot during the process. 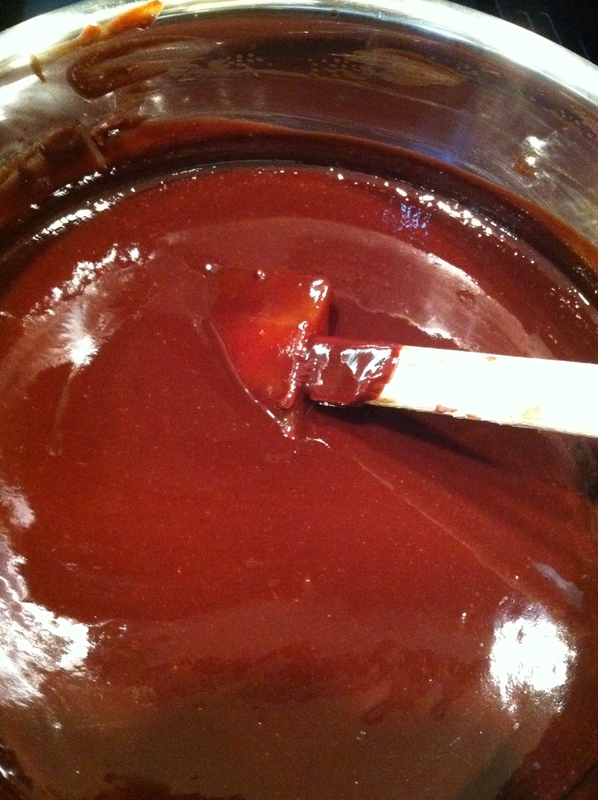 In a double boiler, add the chocolate. If the chocolate is in bar form, break it up into bits for easier melting. Bring the cream to a boil, add to chocolate. Stir to melt smooth. Add the raspberry coulis, vanilla, salt, and butter. Stir to incorporate and ensure everything has melted smooth. 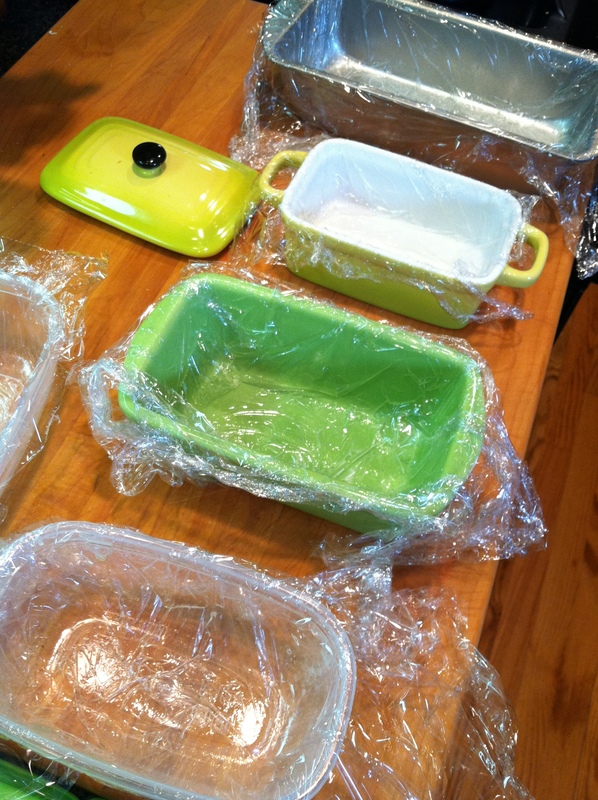 Line your chosen molds with cellophane wrap. Give the wrap a light spray with a pan release spray. This allows the chocolate to be removed from the pan easily once it has chilled. Pour the lined molds with chocolate to the top. Fold the cellophane wrap edges over the chocolate and chill at least 12 hours. 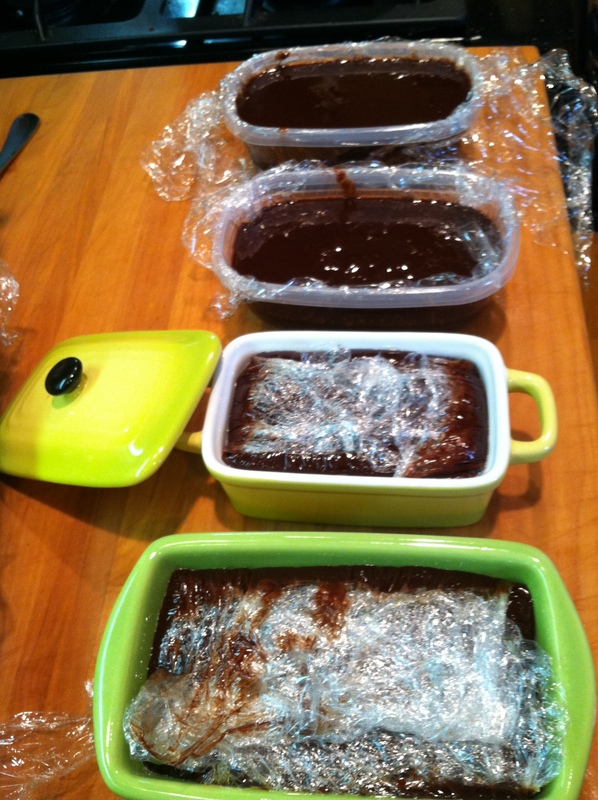 The chocolate pate will become firm but not hard. Remove from the mold, unwrap, and slice to serve. 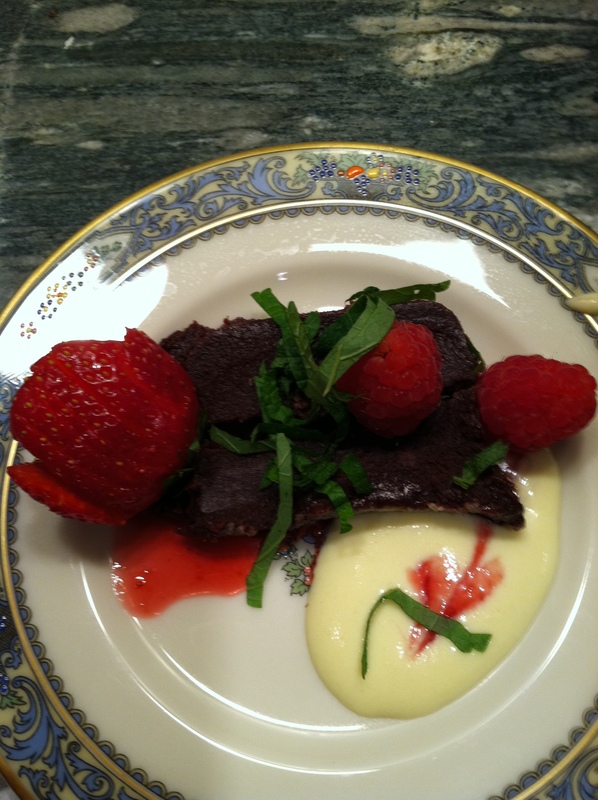 You can serve it with Creme Anglaise (Vanilla Sauce) and Raspberry Coulis accented with fresh berries and mint (or basil!) for garnish. Place 1 cup of raspberries into a blender or food processor. Add the sugar or syrup and blend until liquified – 1-2 minutes. Adjust the sugar content to your taste. You may want more, others less. Using a fine wire mesh strainer, strain the mixture through, rubbing the seeds with the back of a spoon to extract as much pulp as possible. The bright pink seedless result is coulis. You can use almost any fruit to make a coulis. 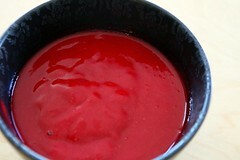 Coulis is simply pureed fruit or vegetables, strained so it is smooth and full flavored. Imagine savory coulis . . . with roasted vegetables . . . the possibilities! 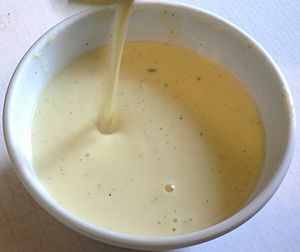 Spoon a small amount of Creme Anglaise onto a plate; spoon Raspberry Coulis beside the Anglaise. If desired, draw a toothpick, skewer or knife tip through the anglaise and coulis to create a swirled design. Add fresh berries and a mint leaf to the plate and serve. Please excuse the quality of the photos; I didn’t have the lighting equipment with me. 1) Dulche de Leche – the first time I ever tasted it in Little Havana in Miami, I knew it would be in my life forever. It is one of the reasons I love Miami. 2) Fireball Jawbreakers – As a kid these were my ‘go to’ candy. My molars suffered and have had required dental treatment. My advice is to stay away from jawbreakers and dentist chairs. They go hand in hand. 4) Short breads are another weakness, especially freshly made ones, with lemon glaze, and a cup of tea. This makes me a very happy girl! 5) Anything with puff pastry or pie dough. I like making them both, making things with them, eating things made with them. There is never a scrap thrown away. 6) Ice cream and sorbet especially home-made ones. Fun thing to do with gatherings of people. I love having just a small “amuse bouche” between hot courses of a meal. 7) This isn’t a like, but really a dislike: cake. I hate cake; making them, frosting them, the way they look, smell, even the sound of the word. Cake, ew. If I had to use a word, ‘gateau’ would work much nicer that ‘cake’. The last cake I made I punched it down to the ground. Then kicked it. Cake murder. I vowed then never to make another cake. So far, I haven’t had to. YAY! This is where I pass it along! This young lady’s blog is full of fun and delicious creations. She shares what works and what doesn’t with a great sense of humor. Check her out! Mandy presents interesting foods and beautiful photography. Her new cookbook is also available, ask her about it. Her posts are delightful. Everything Frugal does is mouth-watering. From his breads, to his desserts and he also estimates how much the dish cost to put on your table. Drop in and see what is on his table today. Thank you again Barbara, I am flattered. This entry was posted in Building Your Community, Recipes and tagged chocolate, chocolate ganache, chocolate pate, Coulis, Crème anglaise, dark chocolate, dark cocoa, Dessert, desserts, food, raspberry, raspberry coulis recipe. Bookmark the permalink. I like your stuff, you deserve it! so fun! what a lovely post. and thank you for all the nice things you wrote. love your dessert. and you don’t have to like cakes to get a cake price 😉 I guess anything sweet works and your sweet was wow. wish I could have some now. love also how relatively easy the method looks. definitely something to bookmark. thank you to share with us your refined taste and your knowledge.